On a Sunday morning this past July, four American children entered a church in Bumangi, Tanzania. They were welcomed as family, embraced, and given gifts of intricately woven East African cloth. Then they heard stories of their great-grandparents from those who still remembered. 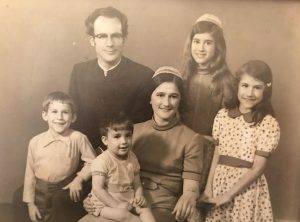 A photo of the David and Grace Shenk family during their time as missionaries in Somalia in the 1960s. Left to right: Jonathan Shenk, David Shenk, Timothy Shenk, Grace Shenk, Karen Shenk Zeager, Doris Shenk. For the children, on a trip with grandparents David and Grace Shenk, to trace the 80-year Shenk family missions legacy in East Africa, that feeling of “coming home” was yet another example of the deep impact made by previous generations of Shenks committed to God’s work around the world. Again and again, the children saw spiritual life, community health, and havens of peace still growing from seeds planted by Shenks who came before. 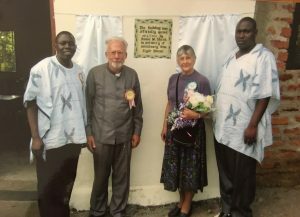 It all started when J. Clyde and Alta Shenk of Lancaster, Pa., sailed for Tanzania in the summer of 1936, backed by the Eastern Mennonite Board of Missions and Charities (now Eastern Mennonite Missions, or EMM). That September, they arrived in East Africa to begin mission work among the Zanaki tribe in the small village of Bumangi, Tanzania. The following year, their son David W. Shenk was born. “I am a North American who grew up in Tanzania, where my parents were pioneer missionaries …. This heritage influences me significantly,” wrote Shenk in the preface of Christian. Muslim. Friend., his latest of 15 books. Shenk, now 79, is an author, professor, interfaith expert, and lately, a global consultant with EMM. With his wife Grace Shenk and a growing family, David Shenk was a missionary among Muslims in Somalia for 10 years and Kenya for six more. Now, the couple is part of EMM’s Christian/Muslim Relations Team, which works to build bridges of friendship between Christians and Muslims while faithfully confessing Christ. Clearly, the missionary legacy started by Clyde and Alta Shenk has carried on with their son and daughter-in- law. “About 10 years ago, a vision was planted in our hearts to take our grandchildren on a missions sojourn, tracing the legacy of their great-grandparents in Tanzania and Kenya,” said Grace Shenk. And in the past several years, the vision finally came true. In 2012, grandchildren Chloe and Owen Corkery and Gabriel Shenk went on the journey. In summer 2016, the remaining four grandchildren, Vanessa and Dulce Shenk Zeager, Amani Kaufman, and Maia Shenk, took the trip to see the places in East Africa that were home to three generations of Shenks. The Shenks’ four children — Karen, Doris, Jonathan, and Timothy — also went along to see the places they remembered from their childhoods, all bringing their spouses. The Shenks’ efforts still shine brightly in the place where it all started: Bumangi, Tanzania. Clyde and Alta Shenk founded Bumangi Mennonite Church in 1940 when three baptized men joined the church fellowship. By 1953, the church’s numbers had grown to 75. In 2016, the three generations of Shenks who attended a Sunday morning service found a congregation of approximately 500, who welcomed the family with open arms. David and Grace Shenk stand outside the new Clyde Shenk school in Migori, Kenya. The seeds of mission planted by the first Shenks in Africa are growing in other ways, too. On the 2012 trip, the Shenk family was invited to plant trees to celebrate the opening of the Clyde Shenk School in Migori, Kenya. The school is for children who have lost parents to HIV/AIDS. The Shenk family also planted a tree in front of the new Alta Shenk Clinic in Bumangi. David and Grace Shenk were encouraged to see God’s continued blessings on their own missionary work in East Africa. In the 1970s, David, Grace, and their children lived in the majority-Muslim suburb of Eastleigh in Nairobi, Kenya. As EMM missionaries, they helped develop the Eastleigh Fellowship Center, which now serves some thousand Muslims each week. Next year David and Grace Shenk turn 80, but they are not finished with missions yet. In 2017, they are already planning Christian/Muslim Relations Team trips to 10 countries, including the Islamic University in Kampala, Uganda; an Islamic university in Sarajevo; Moldova, to teach classes for Central Asian Christians from Muslim backgrounds; and several places in the Middle East.